Coffee Beans of Keys Coffee Co - Keys Coffee Co.
At Keys Coffee Co. we stand behind the product we serve and take great pride in selling the world’s best coffee beans and possess a thorough understanding of our product. 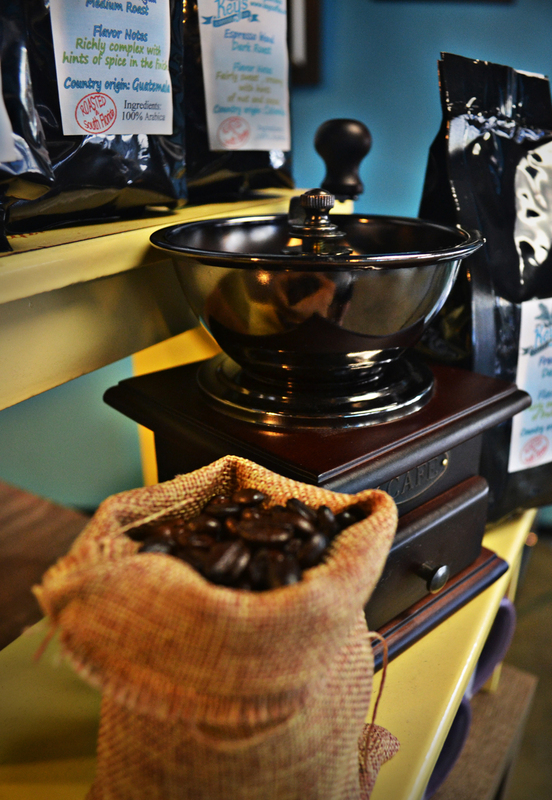 All of the following coffees are available for $8 per half-pound bag, ground or whole bean. The highlands of Guatemala produce several of the world’s finest and most distinctive coffees, and are perhaps best-known for the highland varieties grown in the mountain basin surrounding the colonial city of Antigua. Guatemala Antigua is a coffee that combines complex nuance—smoke, spice, floral and occasionally chocolate flavors—with acidity ranging from gently bright to powerful. Tarrazú is a region on a pacific coast of Costa Rica, which produces about 65 million pounds of what is considered to be the most desirable coffee in the country. Grown at an altitude of 5000 feet, Tarrazú coffee is described as having a “high fine” acidity and is known for its fantastic, smooth aroma. Indonesia is the world’s fourth-largest coffee producer, and coffee plantations cover a total area of more than 3 million acres across three major islands: Sumatra, Sulawesi and Java, an island so predominant in coffee’s storied history that its name is synonymous with the brew. Interestingly, roughly 90% of the plantations in Indonesia are cultivated by small-scale growers. Santos is a port region in Sao Paulo, Brazil’s economic heart and largest city. This coffee-growing area is the standard bearer for Brazilian coffee, and the municipality is actually home to a coffee museum. Brazil is one of the industry’s most prolific exporters, and the country is the largest consumer of coffee in the world. Colombia is the third-largest overall producer, but it is the number one producer of the highly sought-after Arabica bean. In 2011 UNESCO declared the “Coffee Cultural Landscape” of the country to be a world heritage site.